Ron Summer wrote the following memorial for Selden which appeared in Mobile, Alabama’s “Harbinger”. My wife and I were saddened to learn last week of the death of Mr. Selden Kearns. While working in Mobile for Dravo Corporation during the mid-1980s, I had many enjoyable and interesting experiences, but none as memorable as coming to know Selden Kearns. As you may know, Selden’s daughter Emily is a member of the USA staff; if you know Emily, you probably know about Selden, Emily being so much her father’s daughter. I submitted the following letter to the Mobile Register in the hope that it would serve as a small memorial to Mr. Kearns’ memory, but apparently the Register has no space for letters from foreign correspondents. I’m hoping that a publication like yours might be more sympathetic to the memory of a prominent Mobile businessman who labored as diligently as Selden did to enlist corporate support for local cultural and charitable organizations…. Thank you for considering my request, and best of luck with your most interesting publication. As someone who can remember shopping in the downtown Gayfers (is there any spot in Mobile more pleasant than Bienville Square in the early springtime? ), I especially enjoyed the “then-and-now” photo essays on your web site. “In his account of Union spy James Andrews’s attempt to sabotage the railroad connection between Chattanooga and Atlanta, Civil War historian Shelby Foote notes that the Ohio soldiers who accompanied Andrews on his mission all received Congressional Medals of Honor. The Confederate troopers who foiled the plot received a vote of thanks from the Georgia legislature. But no medals. “The Confederacy never had any,” Foote explains, “then or later.” I would have never understood this Confederate approach to service recognition if I hadn’t met Selden Kearns. Selden was one of those rare individuals who by their very person define the artfulness of living a life fully and well. Brilliantly far sighted in his advocacy of business support for the arts, he harbored a withering contempt for aggrandizers and artistic poseurs. Master gardener and gourmet chef, discriminating New Orleans antique shops habitué and perennial Broadway theater patron, Selden was at one and the same time the host of an extraordinarily gracious home and an avid collector of clowns. He was all that, and so much more. A talented musician unmatched in his ability to turn bawdy piano tunes into an instant party, he was also a doting father who delighted in the accomplishments of two talented daughters. A loving son and husband, his ceaseless attention to his mother and beloved wife Elizabeth during their prolonged illnesses bespoke the true meaning of fidelity. An officer of our company many years and several corporate levels superior to me, Selden took time to write a personal letter of congratulation to my son when his work was displayed in a children’s art show at the Fine Arts Museum of the South. The soul of hospitality in welcoming visitors to the Gulf Coast, he imposed only one house rule on guests staying at his company’s apartment in New Orleans: that they extend an appropriate level of respect and consideration to the building’s doormen and maids. Playing the prince to my six-year-old Cinderella, Selden encouraged my daughter to put on her prettiest dress and join the grownups for a jazz night downtown at John Word’s. Samantha learned to love live music that night, but she had long since fallen in love with Mr. Kearns. As had her dad, her mother, and her older brother. Our hearts were broken when we learned of his death this week. Knowing how much good he did in the city where we named our cat Moonpie, we pray that the memory of Selden Kearns will live on in Mobile’s heart. Son of Rhett Goode Kearns and Susan “Susie” Elizabeth Crabtree Kearns, Selden Stephen KEARNS was born 29 Jan 1926 at Mobile AL and died 28 March 2000, age 74, at Mobile, AL. On 10 Nov. 1951, at Dauphin Way Baptist Church in Mobile, AL, he married Elizabeth POOLE, born 15 Dec 1927, died 26 June 1997 at 70 in Mobile, AL. Selden was described by Jean Kearns as a “successful businessman.” He remained in Mobile all his life. In Susie’s later years, he managed her affairs. Jack, a brother, writes, “Selden graduated Murphy High School in 1943 where he took business courses. 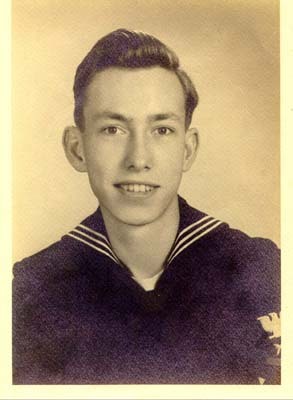 Went into the navy during WWII. Stationed in Okinawa during the closing days of the war.” Selden wrote that he served as a yeoman and was discharged as Yeoman I class. 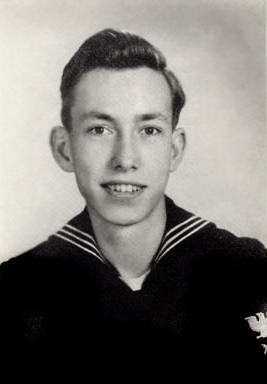 He was employed by a real estate and insurance firm and had employment at Waterman Steamship Corp. as a secretary. He rose to the position of secretary to the Chairman of the Board of Directors. He later became corporate secretary and vice president of Southern Industries Corp. Selden and Elizabeth had two daughters.